Fountain in Heron Square, Richmond. Heron Square is a privately owned block on the riverside at Richmond, ajoining Richmond bridge to the north. Usually the square is opened up on Saturdays to a Farmer’s Market. (They used to have their own web site but I could not find a link to it! It was quite sparse there today, I suppose post Christmas as well as the general cold. 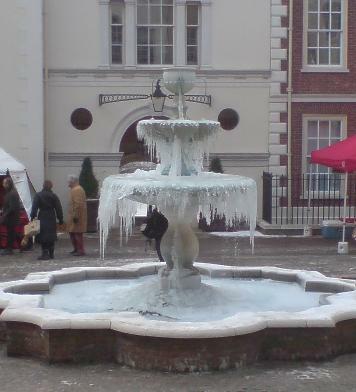 For some reason they had left the fountain running over the cold spell, and it produced a rather intesting effect (above). Out to Oxfordshire today, the first trip to this particular customer this year. While the snow had all gone in London, it was still very evident in the Chilterns (as viewed from the M40), and still a lot of it in the Oxford Plain. 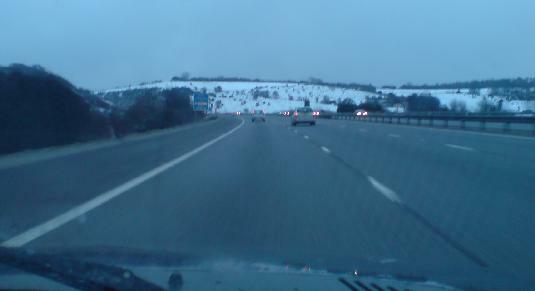 On the way back along the M40 (evening, hence the dull image above), the Chiltern escarpment still showing so much snow is evident. This particular point is where the M40 crosses the greensand [rock formation], and approaches the deep cutting in the chalk near Aston Rowant. The cutting starts towards the right hand of the image and moves across to the left. At one point in the early life of the M40 (1970s), at this point there was a “Crawler lane”, for the lorries and other large vehicles that could could only crawl up the hill. I believe it was the closest such lane to London. These days of turbo-charged diesels and the like, the need has disappeared, as has the lane, and indeed the last time I saw a large crane crawling up the M40 (in fact the slope at the other end of this hill), it did so in the emergency hard shoulder. It clearly was in trouble, if the smoke out of the exhaust was anything to go by, rather than underpowered. photographs show the front garden – almost a week after the snowfall paralysed London on Monday 2.II. In the second photograph, the sticks sticking up approximately in the centre of the pic are the fushia that I described in past posts as having an almost fluorescent flower. 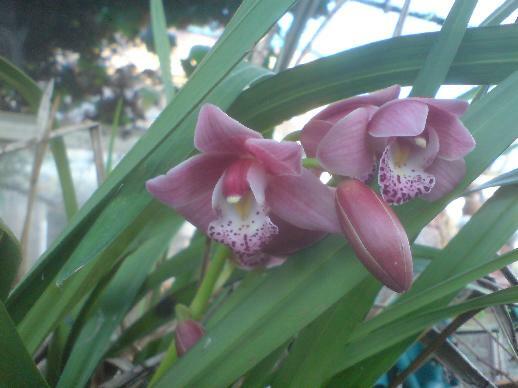 I doubt that it is going to survive this winter; I had planted out the cutting I took of it, in the same bed, this year, not expecting such a harsh winter after the past 17 years. Later on, there were several snow showers, and they were getting heavier. The last photo shows the same plot as the first a couple of hours later, showing the snow covering more plants. BTW, under the tangle of leaves towards the bottom of the pic are the two “Red Cowslip” plants still in the ground (as opposed to the one in the greenhouse). As I tried to leave, I pulled my car back, and got out to say goodbye to mother – but the car suddenly started to slide forward (in the ice) again, so I had to leap in and steer it away from the car in front (which I just missed). Mother’s place is towards the top of a hill in the Chilterns. While it is true that the road the house is in always seemed to be the last to be free of snow, this time, it was snow all across the top of the hill. I feared what I would meet on the steep hill down from the hill whichever route I choose, but as I decended the hill, the snow turned to slush to rain, allowing me to get back to London. (More from this visit in blogs over the next couple of days).